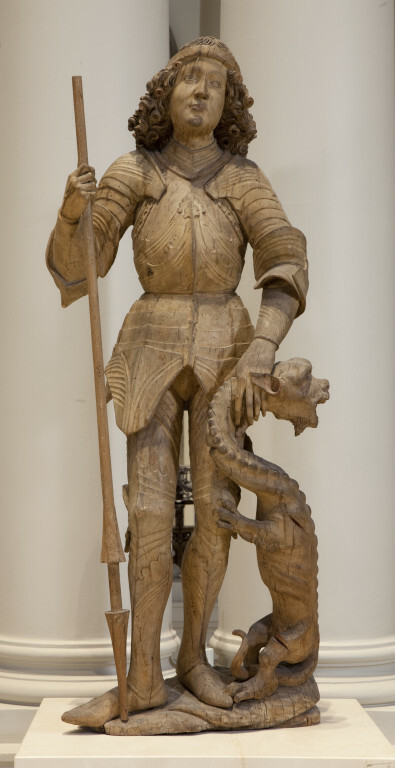 This is a figure of St. George in limewood, and carved from one piece of wood. It originally formed part of the central panel of an altarpiece. 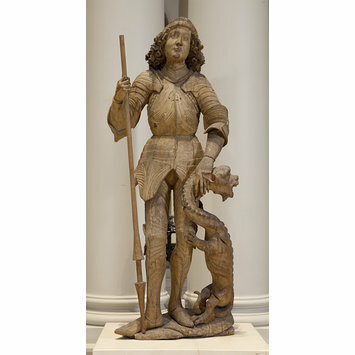 St George was a saint from the East, but as the result of the crusades he became popular throughout Europe. Having rescued a princess by slaying a dragon, he personified the ideals of chivalry and was often depicted with the tamed or dead beast beside him. St. George stands on an irregular base wearing elaborate armour. His raised right hand holds a tournament lance and his left hand is clasped around the turned neck of the dragon. It would have been fully painted, but has subsequently been stripped of its colouring with the exception of flesh tone in the face, traces of black colour indicating the pupils, red traces in the mouth, ear, and the wound of the dragon, and green pigments on the base. The head of the lance is missing and the index finger of the right hand is a later replacement. The back of the body has been hollowed out and the reverse of the base is flat. Formerly in the Prince Pierre de Soltykoff collection, Paris. ; Soltykoff sale, Hotel Drouot, Paris 15 April 1861, lot 231. Fithenry collection, London. Bought in 1913 for £400 from the Fitzhenry sale, Christie's, London 18-24 November 1913, lot 2146. Statue of St. George, figure in limewood, probably Swabian, about 1480-1490. [Catalogue] Burlington Fine Arts Club. Exhibition of Early German Art. 1906. p. 201. no. 27. Habicht. V. Niedersächsische Plastik in England. 1930. pp. 106-107. fig. 88. Jopek, Nobert. German Sculpture 1430-1540: A Catalogue of the Collection in the Victoria and Albert Museum. London: V&A Publications, 2002. cat. no. 28, p. 76.